Ed. Note- Yep, it's over. Sorry guys. When I previewed each of the Celtics’ potential first-round opponents, my verdict for the team Boston wanted face was: “Not the Hawks.” Tuesday’s contest, including Atlanta’s 42-point third quarter in Game 5, was the reason I wrote that. 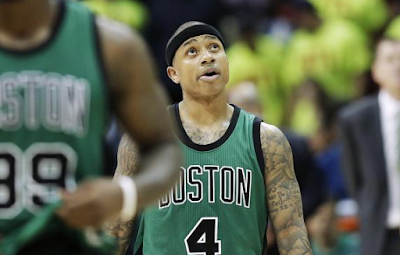 Coming into Game 5’s 27-point loss, the Celtics’ worst losses of the 2015-16 season were both by 24 points. One of those contests was against the Clippers at Staples Center, and the other was, of course, against the Atlanta Hawks at Philips Arena. Before Tuesday’s loss, the Celtics had never lost a playoff game to the Hawks by more than 18 points. Whether it was the fans’ boos or something else, Isaiah Thomas had arguably his worst game as a Celtic. Thomas, who has not missed any of Boston’s games this season, suffered a mild left ankle sprain early in fourth quarter, and it is possible that he was playing hurt before the tweaked ankle occurred underneath the basket. The Eastern Conference’s best defensive team shut down the green’s only all star in Game 5. In addition, he posted a career-worst plus/minus of -33, which was also the worst for any Celtic in a playoff game since 2001. It is the worst plus/minus by any Celtic during the 2015-16 regular season and playoffs. Not only did Thomas post the Celtics’ worst playoff plus/minus in Basketball-Reference’s database of plus/minus data, but Evan Turner’s plus/minus of -29 in Game 5 was also on the dubious leaderboard. It was the second-worst for any Celtic in a playoff game since 2001. Although their plus/minuses were poor, Thomas, who was the Celtics’ high scorer in the first four games of the series, and Turner, who was the Celtics’ high scorer in Game 5, will be immensely needed for their ability to put the ball in the cylinder, because the Hawks plainly have more players who can do so. The X-factors are Marcus Smart, who stepped up his game offensively and defensively in Games 3 and 4, and Jonas Jerebko, who averaged 13.5 points and 11 rebounds in those two contests. Jerebko became just the 12th Celtic since 1984 to put together back-to-back playoff double-doubles. Anybody on a list with Paul Pierce, Kevin Garnett, Rajon Rondo, Danny Ainge, Dennis Johnson, Kevin McHale, Larry Bird and Robert Parish is good in my book. It will be interesting to see if Jerebko starts his fourth consecutive contest. Either way, a couple big shots and defensive efforts from him would go a long way. However, if history is any indication, the Celtics will be heading back to the highlight factory for Saturday’s Game 7. The green has won 10 straight home playoff games against the Hawks, with the last such loss coming in 1988. In addition, the Hawks have lost all five of their potential series-clinching games in Boston. If Game 6 is a Gino-rific victory, then Game 7 will be a toss-up. Although the Hawks will have the upper hand (they were favored by a series-high 7.5 points in Game 5, and have not lost to the Celtics in Atlanta since 2013. Furthermore, Elias tells us that the Game 5 winners of a 2-2 series have advanced 82% of the time) this Celtics team has surprised us before. But if Isaiah Thomas has to change his shoes again, or Kris Humphries shoots better than the Celtics from 3-point land again, Lucky the Leprechaun and company will have to pack up for the summer.